An article published in the journal “Astronomy & Astrophysics” describes a verification of a phenomenon predicted by Albert Einstein’s general theory of relativity. Scientists from the GRAVITY collaboration used observations conducted with ESO’s Very Large Telescope (VLT) in Chile to observe the effects of the motion of a star called S2 as it passes through the extreme gravitational field near the supermassive black hole at the center of the Milky Way. The orbital period of the star S2 is about 15.6 Earth years at a speed that reaches more than 2% of light speed. An article published in August 2017 in the journal “The Astrophysical Journal” described an analysis of its motion and that of some other stars that orbit around the supermassive black hole in the center of the Milky Way, known as Sagittarius A* or simply Sgr A*. 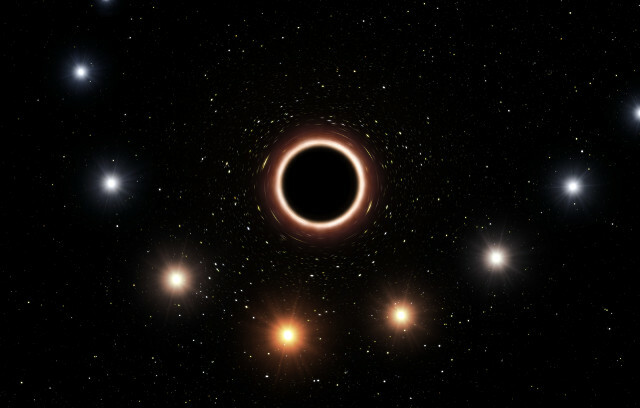 The analysis of their motions led to the conclusion that they were affected by relativistic effects but that’s not the only research that exploits the supermassive black hole to test the general theory of relativity. The scientists of the GRAVITY collaboration used the observations made with three VLT instruments: GRAVITY, SINFONI and NACO to look for traces of gravitational redshift. This phenomenon consists of the stretching to longer wavelengths of the light from a star passing through a gravitational field intense enough to affect that light. A star such as S2, which orbits a supermassive black hole with its very powerful gravitational field, is perfect for this purpose. For 26 years, ESO’s telescopes have been keeping an eye on the star S2, reconstructing its orbit with increasing precision. In the last decade on the VLT the NACO instrument was installed first and then the SINFONI instrument. A few years ago the GRAVITY instrument was installed, perfect for this type of research. On May 19, 2018, S2 passed relatively close to Sagittarius A* and this means that it was the second time that astronomers saw it while it was at the point closest to the supermassive black hole. This time the instruments available were more advanced and allowed to obtain images at a much higher resolution. The SINFONI instrument allowed to measure the speed of the star S2 approaching and moving away from the Earth. The GRAVITY instrument mounted on the VLT Interferometer (VLTI) allowed to accurately measure the constantly changing position of S2 to have precise measurements of its orbit. GRAVITY’s precision is so high that it can reveal the star’s movement from one night to the next while being over 26,000 light years away. The instruments also allowed to detect changes in the light of the star S2 while approaching and getting farther again from Sagittarius A* with the result of detecting the gravitational redshift. The changes in its light’s wavelength matched those predicted by the general theory of relativity. The top image (ESO/M. 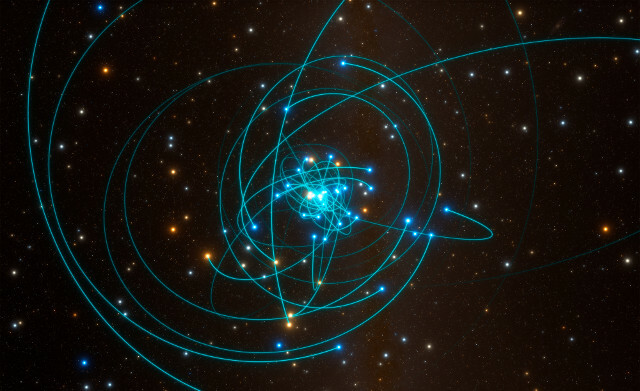 Kornmesser) shows an artistic impression of Sagittarius A* at the center and some positions of the star S2 in its orbit with the differences in its light. The bottom image (ESO/L. Calçada/spaceengine.org) shows a simulation of the orbits of several stars that orbit Sagittarius A*, which include S2. Reinhard Genzel of the Max Planck Institute for Extraterrestrial Physics (MPE) in Garching, Germany, who led a team of scientists from various institutions and around the world, explained that the GRAVITY instrument was crucial in achieving the accuracy in the detections needed to this type of verification. The studies of the stars that orbit Sagittarius A* will continue to carry out further verification of their gravitational redshift but also of other relativistic effects in what is a huge cosmic laboratory.